Blurb/Synopsis: Catalina, or “Cat” as her friends and enemies both lovingly and mockingly call her, continues her quest to free the human race from their dark Vampiric overlords. Confused by love, driven by hate, Cat finds out that the lines of good and evil aren’t as black and white as they once were, but deep and foreboding shades of gray. Just as she has begun to make peace with all of the changes her life has went through, fate shakes things up again. Her closest allies aren’t what they seem, while those who were once enemies may uncover the salvation of human race. This time will Cat land on her feet or fall to the will to those she thought she could trust. Will the lies that are uncovered turn her life inside out or will the truth be more then she can bear. 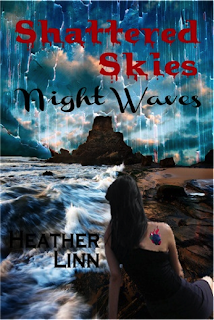 As Cat is torn from her reality can she keep from being consumed by the night waves? My stomach flip-flopped when Walker stopped moving. He sat the box on the desk, took the paper in his hands and started to unroll it. He was doing it ever so carefully and slowly, like he had done this ritual a thousand times before. I knew he wanted us to stop him; to tell him that we changed our minds and we didn't want to know the deep dark secrets the simple piece of paper held. Hell, maybe we should have stopped him. I was kind of hoping one of the two other people in the room with me would stop him but that didn't happen. When none of us spoke, Walker cleared his throat and prepared to read. It was so hard to keep quiet. I didn't want to know. I was holding my breath and didn't even realize it. “Cat, breathe! Darien whispered in my ear and when I didn't respond right away, Kira Grabbed my hand. Just her touch made me expel the oxygen that I was holding in. Darien gave her a warning look that told her not to touch me again. Kira looked right at him. “Fine, lover boy. Next time I will just let her pass out. Would that better than me touching her?” I was in trouble because their arguing wasn't even fazing me. What Walker was doing had my full attention and their little tug of war was going to have to wait. It was like seeing a car wreck coming. You knew that you were looking at something that you really didn't want to see, but you still couldn't help staring. I sat there shaking. Darien calmed me as much as he could; using his thumb to draw sensual circles in my palm and it was helping. The fact that he knew enough to calm me made my heart flutter. I squeezed his hand as tightly as I could and sat and listened to the voice of the man that used to be my father, who was about to read something that might tell me if my fate was set in stone. I closed my eyes and listened as Walker read. Walker ended with a frown. He was still not happy with us for demanding the truth. No one said anything for what seemed an eternity. I couldn’t speak. I had forgotten how to. “Walker that could be about anyone and you know it.” Darien was talking but it seemed as if he spoke from a million miles away. “I think Walker is right,” said Kira. From what he told me about the tests that have been run on Cat and how she saved you three, I think he is right.” Kira's voice seemed to come from even farther away than Darien's had. They all had gotten up and moved and I hadn't even noticed it. Was I going to pass out? Night waves allows you to pick up where the first book left off. 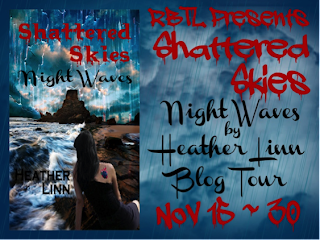 I was glad that I had the options to dive right into to the next edition of the shatter skies series. I really enjoyed the story and its characters and I was happy to be on the adventure again with Cat and the gang. Cat is still a little bull headed and the cause for more strife through her own devices but she remains one tough heroine. The story is packed with action and awesome characters. I love the way the author puts a spin on the vampires in this book, that is why this book is unique in its own way. I look forward to reading more of Heather Linn's books. I rated this book 3 1/2 out of 5 Purple Rant hearts and would recommend this book and series to vampire lovers.